Besides various NoSQL interfaces, standard SQL and Hadoop Hive are coming soon. And besides SSDs, "classic" storage options from Azure Tables are also coming. It will also be included in Azure Stack, that can run on premise. "Azure Cosmos DB natively supports multiple data models. The core type system of Azure Cosmos DB’s database engine is atom-record-sequence (ARS) based. Atoms consist of a small set of primitive types e.g. string, bool, number etc., records are structs and sequences are arrays consisting of atoms, records or sequences. The database engine of Azure Cosmos DB is capable of efficiently translating and projecting the data models onto the ARS based data model. The core data model of Azure Cosmos DB is natively accessible from dynamically typed programming languages and can be exposed as-is using JSON or other similar representations. The design also enables natively supporting popular database APIs for data access and query. Azure Cosmos DB’s database engine currently supports DocumentDB SQL, MongoDB, Azure Table Storage, and Gremlin graph query API. We intend to extend it to support other popular database APIs as well. The key benefit is that developers can continue to build their applications using popular OSS APIs but get all the benefits of a battle-tested and fully managed, globally distributed database system." "What operating systems do friends of Thomas use?" 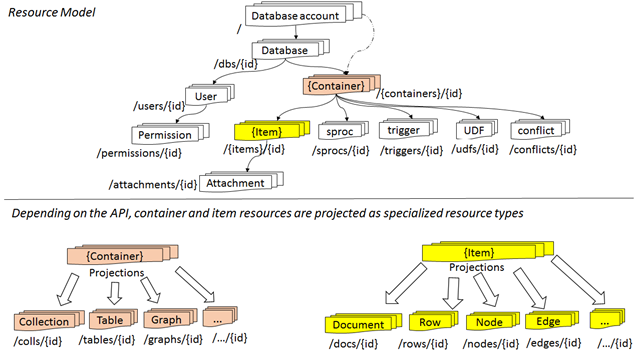 "Titan is a graph database engine. Titan itself is focused on compact graph serialization, rich graph data modeling, and efficient query execution." "AWS supports Titan, using DynamoDB as it's storage backend. You find out more here Amazon DynamoDB Storage Backend for Titan and here Titan Graph Modeling in DynamoDB"